WITH OVER TWENTY YEARS OF DJING UNDER HIS BELT, NUGGET IS A PIONEER OF PITTSBURGH'S DJ SCENE. HE'S HELD DOWN MULTIPLE WEEKLY RESIDENCIES AT EVERY MAJOR NIGHTLIFE VENUE IN THE CITY OVER THE PAST FIFTEEN YEARS AND HAS BECOME A HOUSEHOLD NAME IN PITTSBURGH. 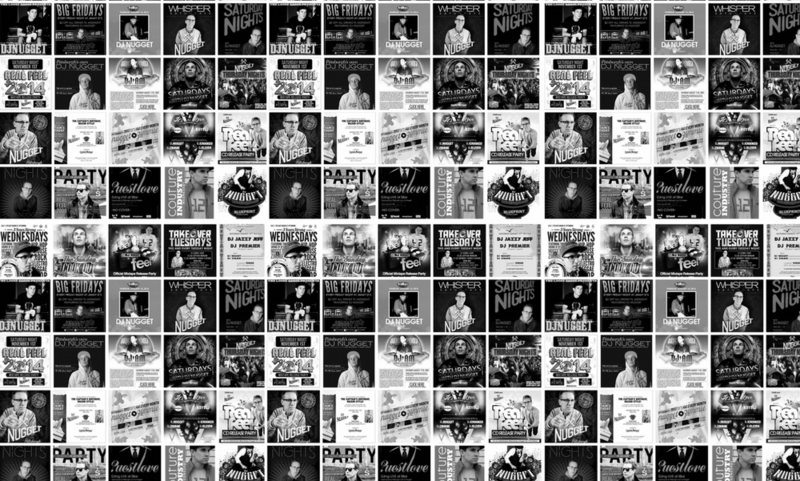 HE'S ALSO GRACED THE DECKS AT NIGHTCLUBS AND BARS ALL OVER THE COUNTRY AND HAS WORKED WITH COUNTLESS CORPORATE CLIENTS TO PROVIDE UNIQUE SOUNDTRACKS FOR THEIR SPECIAL EVENTS. NUGGET'S PASSION FOR MUSIC SHOWS IN HIS SETS AND HE PRIDES HIMSELF ON MIXING THINGS UP, PLAYING A WIDE VARIETY OF GENRES TO ALWAYS KEEP THINGS INTERESTING AND EXCITING ON THE DANCEFLOOR. NUGGET HAS OPENED FOR SOME OF THE BIGGEST ACTS IN THE COUNTRY INCLUDING DIPLO, ?UESTLOVE, DJ AM, MIXMASTER MIKE, BUSTA RHYMES, FAT JOE, DJ CRAZE, PRINCE PAUL AND DJ Z-TRIP TO NAME A FEW. AFTER CUTTING HIS TEETH IN THE DJ SCENE FOR NUMEROUS YEARS NUGGET FOLLOWED THROUGH WITH HIS GOAL TO OPEN A BAR AND OPENED THE GOLDMARK IN PITTSBURGH'S LAWRENCEVILLE NEIGHBORHOOD IN NOVEMBER OF 2015. THE GOLDMARK WENT ON TO WIN "BEST NEW BAR IN 2016" AND "BEST BAR (PITTSBURGH EAST) 2017" IN THE PITTSBURGH CITY PAPER AWARDS. NUGGET ALSO TOOK HOME "BEST PITTSBURGH DJ" IN 2016. NUGGET STILL STILL PLAYS OUT REGULARLY BUT NOW FOCUSES THE MAJORITY OF HIS ATTENTION ON HIS BAR, THE GOLDMARK AND HIS NIGHTCLUB, SCENARIO WHICH OPENED IN NOVEMBER OF 2017 IN PITTSBURGH'S SOUTHSIDE.